I’m starting to gear up for the holiday season – literally. Even though I have a boy I’ve admittedly been low on boy themed toys in my shop. 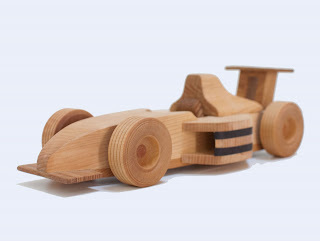 “Make a toy race car” has been on my to do list since my husband made this great race car for my son’s second birthday six months ago. As soon as we gave it to it he began with the noises. “Vrooommm” and off he’d speed. 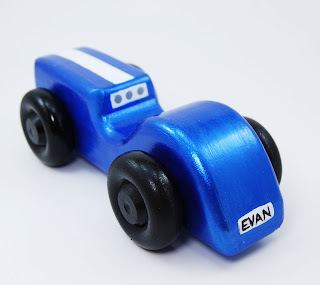 It was clear to me that I’d need to add a race car or two to the Tactile Baby line up if I was going to satisfy the two year old boy set. After a few failed attempts I’ve settled on two designs. 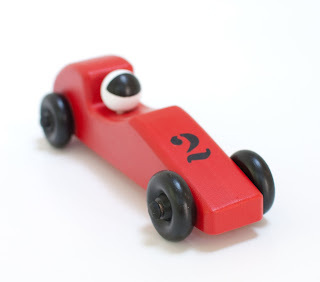 The first is a retro style gentleman's race car. The kind you may have round racing at Monte Carlo in the early 1920’s. 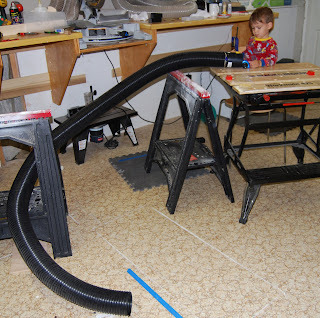 That’s Evan in the photo above pitching the retro car into the “race course” tunnel I set up to occupy him while I painted in my workshop. The second is Formula 1 style, low and sleek and built for speed. Both styles are made from durable poplar hardwood, painted with certified non-toxic paint and triple sealed (for extra durability) with certified non-toxic sealer. And each one has been tested extensively by my two year old and his playmates to ensure the fun factor adn playability levels have been met.